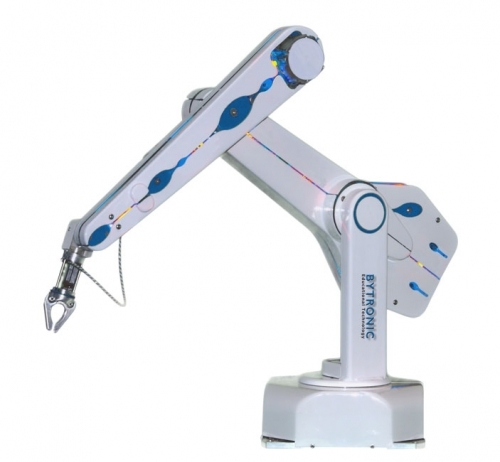 The 5ARA is a complete self-contained five axis vertically articulated robot arm system designed for bench top automation. The hand terminates in a mounting plate for grippers, and comes standard with electric gripper fitted. The 5ARA uses light weight, high efficiency digital motors driving through steel reinforced polyurethane timing belts and the compact micro-stepping drives providing both speed and precise control. The 5ARA includes the simple to use controller with fast CPU and DSP processors an incremental optical encoders and an intuitive teach pad. The 5ARA is, fast, accurate and reliable and has a 500mm reach. It is easy to program and is capable of the most complex tasks. The Software makes getting started easy with the programming of the robot, from very simple tasks to the most complex motions, being quickly and easily programmed. Interfaces and peripherals may be programmed, assisted by project manager software in one Windows screen. The Arm comprises two limbs 250mm each plus 360 degrees base rotation, therefore, the workspace is a sphere 1000mm diameter. The encoders on the 5ARA are miniature optical incremental encoders fitted to each axis and act as watchdogs. The loop is closed after completion of each individual motion, which is not the same as servo control. Without encoders the 5ARA will run accurately and indefinitely open loop without error because of the micro-stepping drives and accurate transmission. If the robot has a collision, the controller will not know and will continue with the program, and the robot could be out of position. Such collisions usually only occur accidentally due to programming error, and it would then be necessary to run the calibration routine after such a collision. A software solution is provided for quick calibration using the encoder to accurately read back the position of the robot when de-energized. The robot can be positioned by hand and its position updated by pressing a key on the keypad. The kinematics software then computes the exact X-Y-Z position of the robot with the hand pitch and roll in degrees.